BigBite Philly would be nothing without the support of our various sponsors and supporters, and we continuously have to give big shout-outs to our long-time supporters who have been with us from the beginning! One of these very awesome and giving supporters, hands down, is Playful Gorilla. Not only has Playful Gorilla given us amazing logo designs, he also kills it when competing in our BigBite Competitions. He competed and placed 2nd in the 2011 Philly Chili Bowl with an Albino Rhino Chili and took 3rd place at the 2011 Wing King Competition with his Karibbean Kraken wings. This guy is a beast! So what is Playful Gorilla? Playful Gorilla is Philly’s own, soon-to-be, start-up toy company. As a budding toy company Playful Gorilla has been hard at work honing in on a new style to bring to the masses. 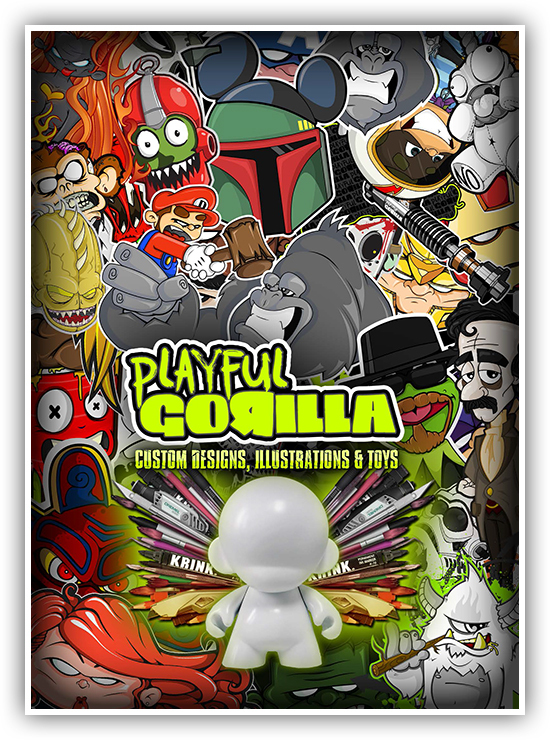 Currently showcasing custom designs, custom illustrations and custom toys, Playful Gorilla seeks to bring a fresh take on awesome properties creating very limited artwork for your viewing pleasure. Playful Gorilla infuses the absolute love of art and its award-winning design talents into everything it produces. With that being said, you can also look to Playful Gorilla for a unique take on all your creative needs! From logos to limited edition t-Shirts; from customized toys to one-off originals sculpts; from character designs to 3d printing; Playful Gorilla has got your stylized design needs covered. Check out some of the playful designs on facebook, and Instagram or follow him on Twitter. This entry was posted on Sunday, February 17th, 2013 at 9:52 am	and tagged with chili bowl, custom illustrations, Food Art, sponsor and posted in Food Art, Philly Chili Bowls, Sponsors. You can follow any responses to this entry through the RSS 2.0 feed.